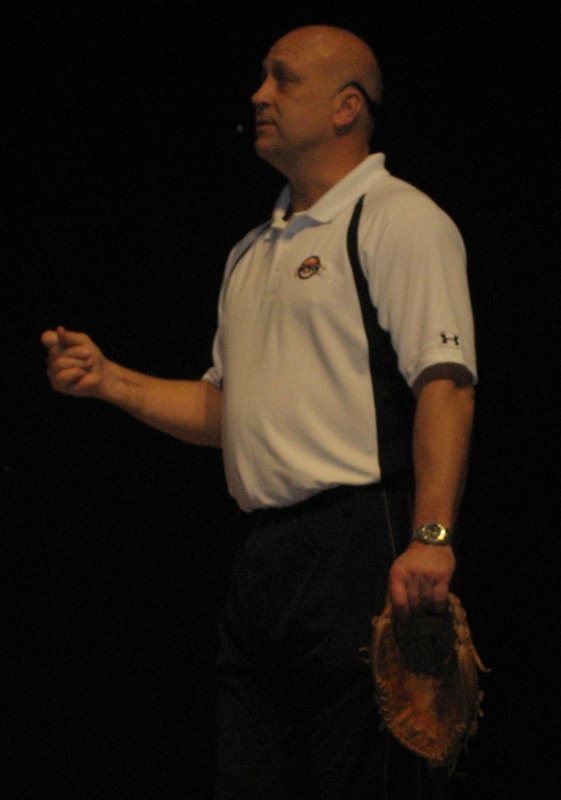 Today, I attended the Cal Ripken Baseball Coaches Clinic with 300 Massachusetts coaches. The program was very well run, entertaining, and reaffirmed some beliefs I hold in regards to baseball fundamentals. Many topics were covered, but I’d like to discuss pick-off plays in this post. Many pitchers and catchers will attempt to throw the ball low and to the bag on pick-off attempts. This seems logical. Pick-off plays are usually bang-bang plays and as such there is little margin for error. 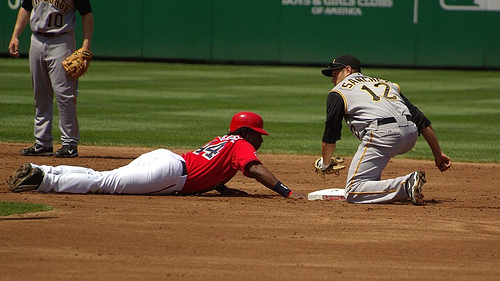 By throwing the ball right on the bag, the fielder does not need to take additional time to apply the tag. As an infielder myself, I have trouble handling pick-off throws around the bag that are thrown at my ankles. 1. Because the ball and runner are arriving at the same time and in the same place, there is a good chance that the ball can ricochet off the batters leg or helmet (if the runner is diving into the base). 2. If you aim low, there is a greater chance you will miss low. This throw can skip into the outfield. Both of these scenarios are much worse than the runner being safe on the pick-off attempt because they can result in the runner advancing a base. My thoughts on this matter were echoed by Billy Ripken. Pitchers or catchers should aim for the infielder’s chest on pick-off throws. The ball will be easiest for the infielder to handle and a throw that goes off target will still likely be handled by the fielder rather than getting away. *Park League All-Star* Chris Plant shares his mental checklist for playing shortstop. Chris Plant played high school baseball in Duxbury, MA and attended Union College, earning an All-Star selecton in 2001. He has played for the Hingham Phillies of the Cranberry League, the Mama’s of the Albany Twilight League, and currently for the Padres of the Boston Park League and the Rangers of the Boston MABL. Chris has been a Park League All-Star 3 times and was a member of the 2007 Park League Champion Padres. Being a good shortstop takes a combination of physical skills and brainpower. Physical skills come with practice and training, but mental skills can be more difficult to hone. Practice certainly helps, but true improvement comes with game experience. Here is a checklist that will help keep your mind on the game for every pitch. 1. Keep it clean: Make sure your area of the infield is free of debris and divots. Pick up any loose stones and smooth out any holes. This will help you avoid bad hops. 2. Know the signs: While in the dugout find out what signs the pitcher and catcher will be using. Knowing what kind of pitch is going to be thrown will allow you to adjust your positioning. If you know the next pitch will be a curveball take a step to your right for a right-handed hitter (vise versa for a fastball). Also, seeing where the catcher is setting up will you give an idea of where the batter is most likely to hit the ball. 3. Know your teammates: Between each pitch, check out your fellow teammates. Notice how deep the outfielders are playing and where the second and third basemen are positioned. With this knowledge you can anticipate what area of the field you will need to cover. Knowing your outfielder’s arm strength gives you an idea on where you should set up for a cutoff throw. 4. Know your opponent: Make sure you know if there are runners on base, and what you will do if the ball is hit to you. Try to determine the speed of the runners on base and the speed of the hitter. Knowing their speed will help you make the correct play. If you bobble a groundball and you know the runner on first base is slow you will not need to rush your throw to second base. 5. Keep your Feet Moving: Once you have determined your positioning, take two steps back. While the pitcher is in his windup take two steps towards the hitter. This will keep your momentum moving in the right direction to field and make an accurate throw. Quick feet are the basis of a good shortstop, and moving before the pitch allows you to react quickly and athletically to any ball hit your way. Wrap-Up: Although this seems like a lot to think about in a short amount of time, these steps will become routine with practice. Eventually you will do them without thinking. This is what we call “Baseball IQ” and as it increases so will your success. More Shortstop Tips From BaseballThink. Many baseball observers underestimate the value of having a 1st baseman who has sound footwork and technique around the bag. It is not always obvious because bad footwork doesn’t necessarily translate into errors. More often, it will result in limited range. In today’s post, I will focus on one fundamental that is extremely important for a 1st baseman- don’t stretch until the ball is on its way. When you stretch before seeing the ball’s path, you restrict your range in all directions (left, right, up, and down). You will have more success if you 1. see the ball, 2. adjust your feet based on the ball’s trajectory, and 3. stretch to the ball. By doing this, you will have a better chance to catch balls thrown to your left and right. Furthermore, you will dig more balls thrown in the dirt and jump higher for balls thrown over your head. This is something that should be practiced, so you are able to do it very quickly. In many cases, you will have a split second to complete all three steps. Once you get it down, you will feel more comfortable around the bag and more confident that you can handle anything thrown at you. You will also make your fellow infielders look better, which they will appreciate. This is an important concept for middle infielders to understand because they are often required to cover a base and receive the ball like a 1st baseman (i.e. when a force out is being made and there is no chance to turn a double play). For example, there is a runner on 1st base and a groundball is hit into the hole on the left side of the infield to the shortstop. There is no chance to turn a double play. The 2nd baseman should cover 2nd base like a 1st baseman and concentrate on making one out. Communication is critical. Before the 1st pitch, it is the shortstop’s responsibility to tell the pitcher he will be turning two through him (the shortstop). Yes, the pitcher probably knows this. But baseball is about routines and consistency. You want to plant the seed in your pitcher’s head so he knows exactly what to do with the ball when he gets it. Hesitation could lead to a busted play. When a ball is hit up the middle, both the shortstop and 2nd baseman are naturally moving towards the bag so it’s important that the pitcher knows who his target will be. This may seem like a picky detail, but coaches who stress small things like this will instill discipline in their players and probably avoid several errors over the course of a season.